SEOUL, Dec. 31, 2013 — LG Electronics (LG) will be unveiling its newest Ultra PC (Model 13Z940) as well as second generation Tab-Book 2 hybrid devices (Models 11T740 and 11T540) at the International Consumer Electronics Show (CES) in Las Vegas, running from January 7 – 10, 2014. Featuring slimmer designs, the company’s latest PC products weigh less than their predecessors and feature refined, minimalistic form factors. With upgraded capabilities and designs, all of the company’s newest PC products — including the attractive All-In-One (AIO) PC model 27V740 — feature Windows 8.1 and employ LG’s superior IPS display technology, ensuring stunning color accuracy, motion clarity and wide viewing angle. 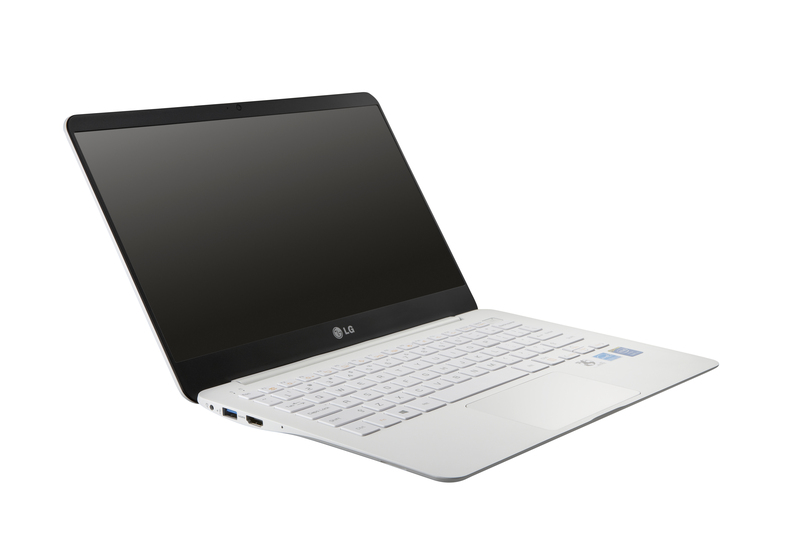 The LG Ultra PC model 13Z940 weighs less than 1kg and sports a clean, minimalist design. LG’s streamlined model offers improved processing, excellent graphics performance and extended battery life thanks to the Haswell Intel® Core™ i5 processor. The LG Ultra PCalso provides instantaneous booting with its solid-state drive (128GB or 256GB) for quick access and greater user convenience. The 13Z940 Ultra PC has a Full HD 13.3-inch IPS display that incorporates the company’s Super Narrow Bezel design for an industry-leading 4.4mm thin bezels. The LG Ultra PC measures only 13.6mm at its thickest point and weighs in at a very travel-friendly 980g. The Ultra PC features Reader Mode, allowing the user to alter the background of any onscreen image to resemble paper, reducing eye-strain and energy consumption. The latest Tab-Book 2 models build on the success of LG’s original Tab-Book, which made its first appearance at CES 2013. 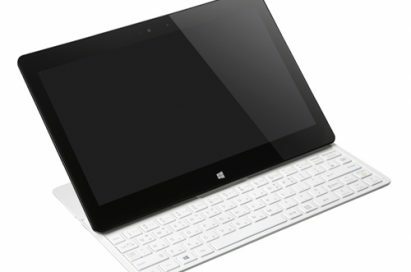 Running Windows 8.1, both new models in the Tab-Book series are optimized for 10-point touch control and offer slide-out QWERTY keyboards hidden under the11.6-inch touchscreen. With a press of a button on the side of the unit, the keyboard glides smoothly out from beneath the display for immediate action. The flagship model 11T740 Tab-Book 2 is only 16.7mm thin, making it a superb solution for consumers wanting greater portability without sacrificing features. Tipping the scales at a just 1.05kg, this unique device incorporates an 11.6-inch Full HD IPS display for a maximum brightness of 400nit lumens for easy viewing outdoors. Perfectly suitable for both on-the-go entertainment and work, the model 11T740 Tab-Book 2 implements a fourth generation Intel® Core™ i5 processor to deliver outstanding performance and a seamless user experience. 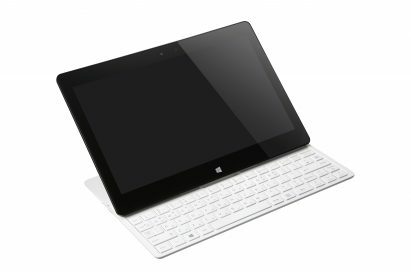 Model 11T740’s little sister, model 11T540 Tab-Book 2, is even lighter at only 930g with a thickness of just 13.7mm. The LG 27-inch AIO PC has a crystal clear Full HD IPS display and runs the Windows 8.1 operating system. Perfectly at home as a TV, monitor or personal computer, the LG AIO PC can easily switch from computer to TV mode using the included remote without having to reboot the PC. For computing and graphics processing power, the new model contains an Intel® Core™ CPU and NVIDIA GeForce GT 740M graphics card. What’s more, its picture-in-picture (PIP) feature makes it possible to watch TV and browse the internet simultaneously. The AIO PC is equipped with an HDMI jack to connect to a Blu-ray player, sound bar or other HD home entertainment components.